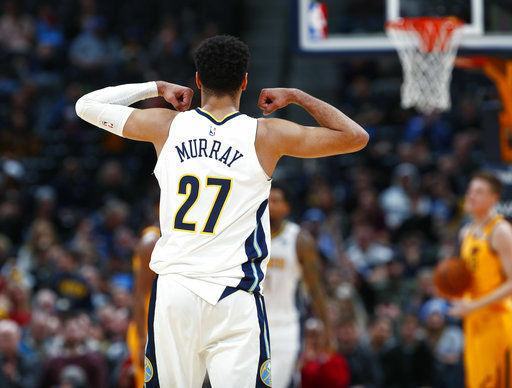 DENVER (AP) — Jamal Murray scored 13 of his 22 points in the first quarter and the Denver Nuggets overcame the ejection of Nikola Jokic to beat the Utah Jazz 107-83 on Tuesday night. Jokic had 13 points and seven rebounds before getting tossed in the fourth quarter. Wilson Chandler and Gary Harris scored 15 apiece to help Denver win its third in a row. Despite the rout, Jokic got tangled up with Jonas Jerebko early in the fourth and was called for a flagrant 2 foul and ejected from the game. The Jazz cut it to 13 after Jokic left, but Murray converted a three-point play and Trey Lyles had a driving dunk to push the lead to 90-72 with 5:38 left. Derrick Favors had 20 points, and Jerebko and Donovan Mitchell each scored 13 for the Jazz. The Nuggets showed no sign of complacency after big road wins at Portland and Golden State last weekend. They used a 12-0 run late in the first quarter to take a 13-point lead, and another big run at the end of the second to lead 50-34 at halftime. Unlike the two meetings in Utah this season, Denver didn’t collapse in the second half. 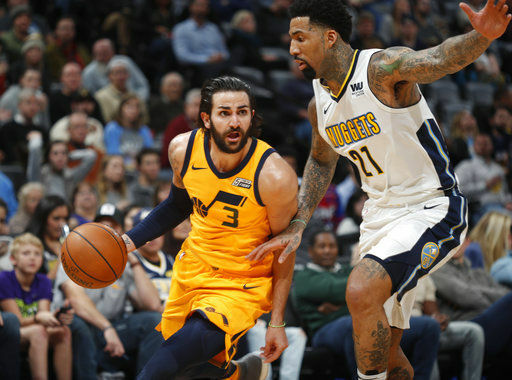 The Nuggets led by 21 less than four minutes into the third and maintained a comfortable lead throughout the second half to improve to 12-3 at home. Jazz: Mitchell entered second in the NBA in scoring among rookies at 18 points per game. Lakers G Kyle Kuzma (18.1 ppg) is first. … G Raul Neto missed his eighth straight game with a concussion. … C Rudy Gobert (left knee sprain) was with the team but sat out for the sixth straight game. Nuggets: G Emmanuel Mudiay was active after missing four straight games with a sprained right ankle. He entered in the final two minutes and scored seven points. He hit a 3-pointer, was fouled and made the free throw and then hit another 3 on Denver’s next possession. … Denver held the Jazz to 28.9 percent shooting in the first half and a season-low 34 points over the first two quarters. … Lyles had 16 points and eight rebounds against his former team. Jazz: Play at Golden State on Wednesday night. Nuggets: Travel to Minnesota to play the Timberwolves on Wednesday night.